John W. Valley, William H. Peck, Elizabeth M. King (1999). The Outcrop for 1999, University of Wisconsin-Madison Geology Alumni Newsletter, p 34-35. New techniques for oxygen isotope analysis have lead to the first studies of oxygen isotope geochemistry of zircons (1,2). Zircon is shown to be highly retentive of oxygen isotope ratios, preserving the best record of igneous composition even in samples that have enjoyed high grade metamorphism or hydrothermal alteration. Zircon is a ubiquitous trace mineral (ZrSiO4) in many igneous, metamorphic, and clastic sedimentary rocks. Its ability to concentrate uranium and exclude lead forms the basis of U-Pb geochronology and its refractory nature and concentric growth patterns create robust records of crystallization age. The ability to analyze oxygen isotope ratios in a sample that has been dated, directly links the magmatic composition to known geologic events and has opened many new and exciting avenues for study. Several recent graduate theses at the University of Wisconsin-Madison have incorporated some aspect of zirconology: Carrie Gilliam (MS 1996) and Salma Monani (MS 1999) showed that shallowly intruded, sub-volcanic Tertiary granites from the Isles of Skye and Arran, Scotland formed by melting of anomalous rocks in the deep crust (3, 4). Liz King (MS 1997, PhD 2001) completed a comprehensive survey of Archean igneous rocks in Canada (5) that lead to a reevaluation of the genesis of one of the world’s richest base metal ore deposits (6). William Peck (MS 1996, PhD 2000) is studying anorthosite and related Proterozoic granitoids in the Grenville Province and has discovered oxygen isotope provinciality that appears to identify a cryptic continental suture and an accretionary plate margin that is now buried in the deep crust (7). Ilya Bindeman, (UW postdoc) has discovered that Yellowstone’s postcaldera rhyolites contain zircon xenocrysts which are zoned with respect to oxygen isotopes and age, as determined by laser abrasion, ion microprobe and SHRIMP. This provides critical evidence on zircon recycling, and the origin and potential hazard of volcanism in young calderas (10). Another advantage of oxygen isotope studies of zircons stems from the fact that oxygen is the most abundant element in the crust. Thus oxygen is affected by different processes than trace elements or radiogenic isotopes that are commonly employed to study crustal growth and evolution. This difference is dramatically revealed by a comparison all existing data for zircons (8) from the Canadian Shield (Fig. 1). Archean age samples (2.7 to 3.0 Ga) have a very restricted range of d18O value (5.7±0.6‰) that is consistent with high temperature equilibrium with a primitive mantle reservoir and small amounts of supracrustal recycling (Fig. 2). In contrast, the Proterozoic samples from the Grenville show a much larger range and a higher average value (8.2±1.7‰). These higher values in the younger terrane result from processes that can only occur at the Earth’s surface: weathering and low temperature alteration. The high d18O signature of surfical processes must be buried in the form of sediments and altered rocks to deep in the crust in order to become incorporated in granitic magmas by melting and assimilation. Thus, the deep crust beneath the Grenville Province is dramatically different from the more primitive, early crust of the Superior Province. The quantity of high d18Osupracrustals is much smaller in the Archean. These results lead to speculation that the differences seen in North America may be worldwide trends and that sedimentation may have been less voluminous and of a different character during early Earth history. The Wisconsin group is now actively studying zircons from many other terranes, including: less than 1Ma rhyolites at Yellowstone (10),the world’s oldest known zircons from Australia (4.4 Ga, 11), and mantle-derived megacrysts from Kimberlite pipes (9). The results suggest that this trend is worldwide and that a major, non-uniformitarian change occurred at the end of the Archean (2.7 Ga). 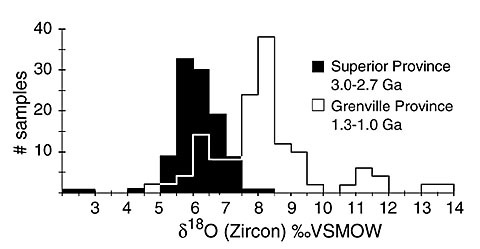 (1) Valley JW, Chiarenzelli JR, McLelland JM (1994) Oxygen isotope geochemistry of zircon. Earth and Planet. Sci. Lett 126:187-206. (2) Valley JW, Kitchen N, Kohn MJ, Niendorf CR, Spicuzza MJ (1995) UWG-2, A garnet standard for oxygen isotope ratios: Strategies for high precision and accuracy by laser heating. Geochim. Cosmochim Acta 59: 5523-5531. (3) Gilliam C and Valley JW (1997) Low d18O magma, Isle of Skye, Scotland: Evidence from zircons. Geochim. Cosmochim. Acta 61: 4975-4981. (4) Monani S and Valley JW (2001) Oxygen isotope ratios of zircon: Magma genesis of low d18O granites from the British Tertiary Igneous Province. Earth and Planet. Sci. Lett. 184: 377-392. (5) King EM, Valley JW, Davis DW, and Edwards G (1998) Oxygen isotope ratios of Archean plutonic zircons from granite-greenstone belts of the Superior Province: Indicator of magmatic source. Precamb. Res 92: 365-387. (6) King EM, Barrie CT and Valley JW (1997) Hydrothermal alteration of oxygen isotope ratios in quartz phenocrysts, Kidd Creek Mine, Ontario: Magmatic values are preserved in zircon. Geology 25: 1079-1082. (7) Peck WH, Valley JW, Corriveau L, Davidson A, McLelland JM, Farber D (2001) Terrane-scale oxygen isotope heterogeneity in the lower crust of the southern Grenville Province, in review. (8) Peck WH, King EM and Valley JW (2000) An oxygen isotope perspective on Precambrian crustal growth and maturation. Geology 28: 4: 363-365. (9) Valley JW, Kinny PD, Schulze DJ, Spicuzza MJ (1998) Zircon megacrysts from kimberlite: oxygen isotope heterogeneity among mantle melts 133: 1-11. (10) Bindeman IN and Valley JW (2000) Formation of Low d18O Rhyolites after caldera collapse at Yellowstone. Geology 28: 8: 719-722. (11) Wilde SA, Valley JW, Peck WH and Graham CM (2001) Evidence from detrital zircons for the existence of continental crust and oceans on the Earth 4.4 Gyr ago. Nature, v. 409, pp. 175-178. King EM, Valley JW, and Davis DW (2000) Oxygen isotope evolution of volcanic rocks at the Sturgeon Lake volcanic complex, Ontario. Canadian Journal of Earth Science, v. 37, p. 39-50. Peck WH, Valley JW, Wilde SA, Graham CM (2001) Oxygen isotope ratios and rare earth elements in 3.3 to 4.4 Ga zircons: Ion microprobe evidence for high d18O continental crust and oceans in the Early Archean. Geochimica et Cosmochimica Acta, 65: 22: 4215-4229. Bindeman IN and Valley JW (2001) Low-d18O Rhyolites from Yellowstone: Magmatic Evolution Based on Alalyses of Zircons and Individual Phenocrysts. Journal of Petrology, 2001, v. 42; no. 8; p. 1491-1517. King EM, Valley JW (2001) Source, magmatic contamination, and alteration of the Idaho batholith. Contrib. Mineral Petrol. (2001) 142: 72-88. Bindeman IL, Fournelle JH, Valley JW (2001) Low-d18O tephra from a compositionally zoned magma body: Fisher caldera, Unimak Island, Aleutians. J. Volcan. Geotherm. Res. 111:35-53. King, E.M., Valley, J.W., Davis, D.W. Kowalis, B.J. (2001) Empirical determination of oxygen isotope fractionation factors for titanite with respect to zircon and quartz. Geochimica et Cosmochimica Acta 65:3165-3175. Wei, C.S., Zheng, Y., Zhao, Z., Valley, J.W. (2001) Oxygen isotope Evidence for two-stage water-rock interactions of the Nianzishan a-type granite in NE China. Chinese Sci. Bull. 46: 727 731. Monani, S, Valley JW. (2001) Oxygen isotope ratio of zircon: magma genesis of low d18O granites from the British Tertiary Igneous Province, western Scotland. Earth and Planetary Science Letters, 184, 377-392. Wilde, S.A., Valley, J.W., Peck, W.H., and Graham, C.M. (2001) Evidence from detrital zircons for the Existence of continental crust and oceans on the Earth 4.4 Gyr ago. Nature, 409, 175-178. Bindeman, IN, Valley, JW (2002) Oxygen isotope study of the Long Valley magma system, California: isotope thermometry and convection in large silicic magma bodies. Contr Min Petrol 144: 185-205. Valley, JW, Peck, WH, King, EM, Wilde, SA (2002) A cool early Earth. Geology 30: 351-354. Wei CS, Zheng YF, Zhao ZF, Valley JW (2002) Oxygen and neodymium isotope evidence for recycling of juvenile crust in northeast China. Geology, April 2002; v. 30; no 4; p. 375-378. Ferreira, VP, Valley, JW, Sial, AN, Spicuzza, MJ (2003) Oxygen isotope compositions and magmatic epidote from two contrasting metaluminous granitoids, NE Brazil. Contr. Min. Pet. 145: 205-216. Peck WH, Valley JW and Graham CM (2003) Slow oxygen diffusion rates in igneous zircons from metamorphic rocks. American Mineralogist, Volume 88, pages 1003-1014. Valley JW, Bindeman IN, and Peck WH (2003) Empirical calibration of oxygen isotope fractionation in zircon. Geochimica et Cosmochimica Acta, Vol. 67, No. 17, pp. 3257-3266. Bindeman IN, Valley JW (2003) Rapid generation of both high- and low-d18O, large-volume silicic magmas at the Timber Mountain/Oasis Valley caldera complex, Nevada. GSA Bulletin, May 2003; v. 115; no. 5; p. 581-595. Valley JW (2003) Oxygen Isotopes in Zircon. Reviews in Mineralogy and Geochemistry: v. 53, 2003, Chapter 13, pp. 343-385. McLelland JM, Bickford ME, Hill BM, Clechenko CC, Valley JW, Hamilton MA (2004) Direct dating of Adirondack massif anorthosite by U-Pb SHRIMP analysis of igneous zircons: Implications for AMCG complexes. Geol. Soc. Am. Bull 116: 1299-1317. Wiedenbeck M, Hanchar JM, Peck WH, Sylvester P, Valley J, Whitehouse M, Kronz A, Morishita Y, Nasdala L (2004) Further characterization of the 91500 zircon crystal. Geostandards and Geoanalytical Research 28: 9-39. Black LP, Kamo SL, Allen CM, Davis DW, Aleinikoff JN, Valley JW, Mundil R, Campbell IH, Korsch RJ, Williams IS, Foudoulis C (2004) Improved 206Pb/238U microprobe geochronology by the monitoring of a trace-element related matrix effect; SHRIMP, ID-TIMS, ELA-ICP-MS, and oxygen isotope documentation for a series of zircon standards. Chemical Geology, 205, 115-140. King EM, Valley JW, Stockli DF, Wright JE (2004) Oxygen isotope trends of granitic magmatism in the Great Basin: Location of the Precambrian craton boundary as reflected in zircons. GSA Bulletin, March/April 2004: v. 116; no. 3/4; p. 451-462. 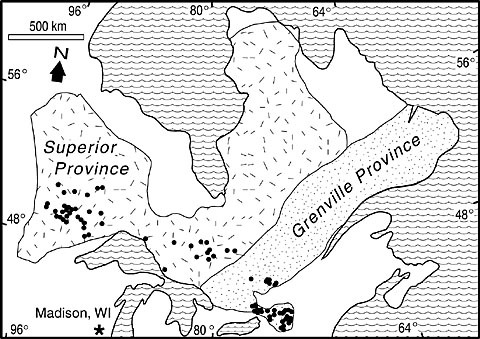 Peck WH, Valley JW, Corriveau L, Davidson A, McLelland J, and Farber DA (2004) Oxygen-isotope constraints on terrane boundaries and origin of 1.18-1.13Ga granitoids in the southern Grenville Province. In Proterozoic tectonic evolution of the Grenville orogen in North America, Tollo RP, Corriveau L, McLelland J, and Bartholomew MJ, eds. : Boulder, Colorado, Geological Society of America Memoir 197, p. 163-182. Cavosie AJ, Wilde SA, Lui D, Weiblen PW, and Valley JW (2004) Internal zoning and U-Th-Pb chemistry of Jack Hills detrital zircons: a mineral record of early Archean to Mesoproterozoic (4348-1576 Ma) magmatism. Precam. Res., v.135, p. 251-279. Cavosie AJ, Valley JW, Wilde SA, and EIMF (2005) Magmatic d18O in 4400-3900 Ma detrital zircons: A record of the alteration and recycling of crust in the Early Archean. Lackey JS, Valley JW, Saleeby JB (2005) Supracrustal input to magmas in the deep crust of Sierra Nevada. Earth and Planetary Science Letters 235, 315–330. Valley JW (2005) A Cool Early Earth? Scientific American, October 2005, 58-65. Valley JW, Lackey JS, Cavosie AJ, Clechenko CC, Spicuzza MJ, Basei MAS, Bindeman IN, Ferreira VP, Sial AN, King EM, Peck WH, Sinha AK, Wei CS (2005) 4.4 billion years of crustal maturation: oxygen isotopes in magmatic zircon. Contr. Mineral. Petrol. DOI 10.1007/s00410-005-0025-8.